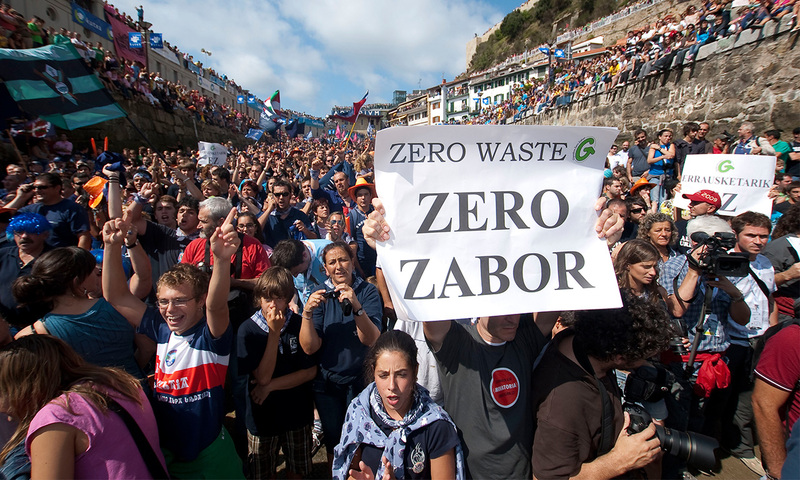 Hernani is one of the first towns in Gipuzkoa to have declared Zero Waste. As a result, since 2009 waste recycling has almost quadrupled whereas waste generation has been substantially decreased. This is their story. In 2002, the regional waste management consortium in Spain’s Gipuzkoa Province, faced with a nearly full landfill, proposed building two new incinerators. Citizens strongly opposed the incinerators and prevented one from being built and the new party elected in 2011 stopped the second one. Hernani and two other small cities in the region established an ambitious program of door-to-door collection of source-separated waste, including organics. The amount of waste going to the landfill in places where the Zero Waste strategy has been embraced has been reduced by 80 percent. With new political leadership opposed to incineration, door-to-door collection is expanding throughout the region. Hernani is a city of over 19,000 residents in the Basque Country of Spain. Together with nine other municipalities, it is part of the San Marko mancomunidad (a free association of municipalities), created to manage solid waste jointly. At the provincial level, all the mancomunidades plus the provincial government comprise a consortium that promotes and manages the Gipuzkoa Integrated Waste Management Plan. Hernani’s former municipal waste management system strongly relied on waste disposal complemented by a limited recycling system. While citizens could voluntarily dispose of recyclables in the four large containers placed on the streets, most of the city’s waste went to the landfill. In 2002, when the San Marko landfill was nearly full, the provincial government presented a controversial plan: the addition of another container for the voluntary recycling of organic materials and the construction of two new incinerators. Citizen opposition to incineration was immediate. Since then, the region has been immersed in a tenacious dispute between those who want to build the incinerators and those who promote waste prevention policies and better source separation strategies. Joining the citizens’ opposition, some municipalities decided not only to reject the plan to build new incinerators but also to implement an alternative to burying or burning. Usurbil was the first municipality to do so. This town of 6,000 people established a door-to-door collection system of source-separated waste streams, including organic materials. In just 6 weeks, the amount of collected waste destined for landfills dropped by 80%. The resource recovery rate registered in the first year was 82%. In 2008, before door-to-door collection started, Usurbil was taking 175 tons per month to the landfill. One year later, the amount had dropped to 25 tons. In May 2010, after two months of dialogue with the citizens to explain and solicit input on the new system, Hernani followed the model of Usurbil. The municipality distributed two small bins per household, placed hooks to hang the bins and bags at the front of houses and buildings, removed the large containers from the streets, established waste segregation as mandatory, and launched door-to-door collection. Citizens began to place separated organics, light packaging, paper and cardboard, and residuals in front of their houses. Each stream has a designated pick-up day: organics on Wednesdays, Fridays, and Sundays; light packaging on Mondays and Thursdays; paper and cardboard on Tuesdays; and residuals on Saturdays. Light packaging is placed in bags, and the government sells reusable bags for this purpose. Paper and cardboard are tied in bundles or placed in boxes or bags. Organics are placed in the bins provided by the government, and the residuals are disposed of in bags. The collection is done by a public company called Garbitania, created by the governments of Hernani, Usurbil, and Oiartzun. Collection is done at night, with a complementary shift during the morning. Each bin and each hook have a code that identifies the household that uses them. This allows the government to monitor separation in each household. If the collector identifies a stream that does not correspond to that collection day, s/he puts a sticker with a red cross on the bin and does not collect that waste. The information is given to the administration office, and the household receives a notice explaining why the waste was not collected. For glass, the system of large containers on the streets was maintained, and door-to-door collection is done only in the old part of the city. A non-profit association created by producers, packers, bottlers, and recyclers handles this stream. The association is funded by contributions the packaging companies pay for each product they put on the market. If someone misses the door-to-door collection, there are four emergency centers to drop off waste. There is also a drop-off site that takes bulky waste, electric and electronic devices, and other waste not covered by the door-to-door collection free of charge. For businesses, the collection schedule is the same as for households, with an extra day of collection for residuals. In rural areas, home composting is mandatory, and other streams are either collected door-to-door or taken to drop-off centers. Under the new system, Hernani promotes home composting throughout the municipality. People can sign up for a composting class, request a home composting manual, and receive a compost bin for free. There is a phone line to get composting advice, and there are compost specialists who can visit households in need of assistance. People who sign up to compost at home receive a 40% discount on the municipal waste management fee. The fee for businesses varies according to the collection frequency and the amount of waste produced, using pay as you throw criteria. The San Marko mancomunidad operates a materials recovery facility where light packaging is sorted for sale. Paper and cardboard are sold to a recycling company nearby. Organic materials must be taken 50 km away to a compost plant, operated by the provincial consortium. Source separation is reflected in the material that Hernani takes to the compost plant, which consists of—on average—only 1.5% impurities (non-organics and other pollutants). In the first full month of the door-to-door collection, the residuals dropped by 80%, and the total waste managed decreased by 27%. 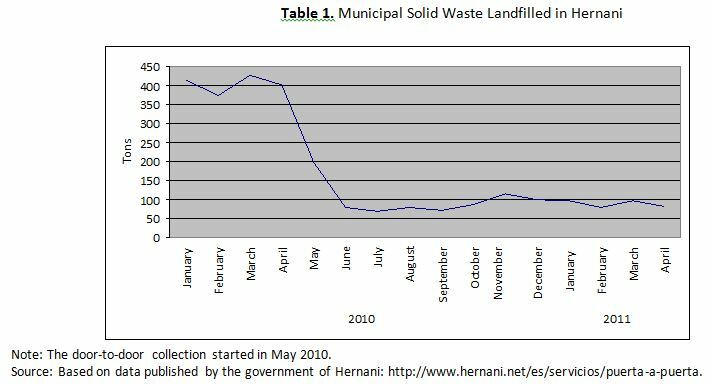 In 2010, the municipality landfilled 53.8% less waste than in 2009 (5,219 tons in 2009 and 2,412 tons in 2010), and door-to-door collection had only begun in May. The governments that have implemented door-to-door collection programs have promoted the creation of citizens´ committees to monitor their implementation. Moreover, local Zero Zabor (Zero Waste) groups have emerged in these cities, building on earlier anti-incinerator movements. The different local groups are working together in Gipuzkoa Zero Zabor. In a few years, these volunteer activists have advanced the conversation from opposing incinerators to promoting an authentic Zero Waste strategy that focuses on preventing waste—through changes in design, production, and consumption—and recovering all materials discarded in a safe and sustainable manner. Hernani joined other municipalities and groups opposing the incinerators and promoting the extension of door-to-door collection to the entire Gipuzkoa province. Many municipalities in the region are reticent to opt for Zero Waste strategies, and this threatens to undermine the progress being made in cities that use these strategies. However, since the municipal elections in July 2011, the political scenario has changed. 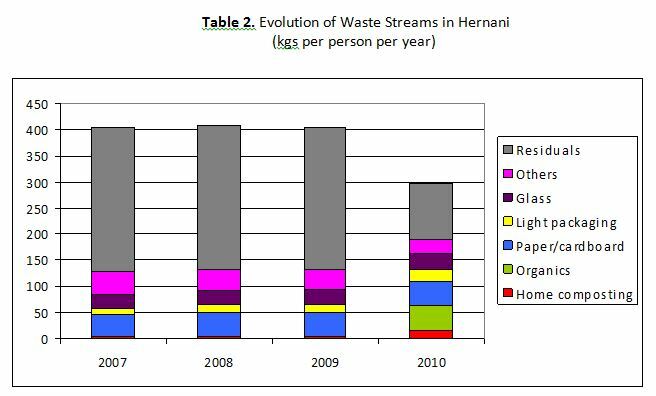 In 2010, Hernani produced an average of 500 tons of municipal solid waste per month, and had a per capita generation of 0.86 kg per day, compared to 1.1 kg the year before. The recent economic crisis in Spain has resulted in a general reduction in waste production in the country. The implementation of the new door-to-door collection system and the communication campaign about waste may have raised people’s awareness about waste, leading to changes in buying behavior. Finally, the former system of large bins probably made it easier for people to put non-residential waste in the bins (for instance, construction and demolition waste), and the current system of individual bins makes it more difficult to do that. 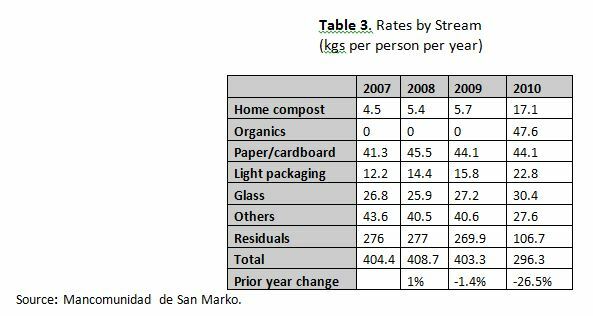 The following tables show the evolution of the composition of residential waste in Hernani before and after adoption of the door-to-door collection system. Table 3 provides the specific amounts for each waste stream. The table below shows that Usurbil, Hernani, and Oiartzun have reduced the residual waste per capita in a very short time, while in other municipalities the figure remains constant. The fourth municipality to adopt door-to-door separated waste collection, Antzuola, has reported that 90% of the discards collected are separated for recovery, and residuals represent only 10% of the total collected there. The government of Hernani compared the costs of the door-to-door collection system with the previous one that used four large containers, as shown below. Usurbil has collected enough data to compare the actual expenses of both collection systems for a full year. The results show that the door-to-door collection system is actually less expensive than the container system, mostly due to the income generated from the sale of recyclable materials. Skeptics of source separation maintain that the costs increase prohibitively when moving from one-stream collection to a differentiated collection system. Although collection expenses do tend to increase in most cases, that is not the whole story: the differentiated collection increases resource recovery, which offsets disposal costs and creates a source of income through the sale of recyclables (and organics, in other cities). As shown above, in Usurbil the new system was less expensive than the previous one. 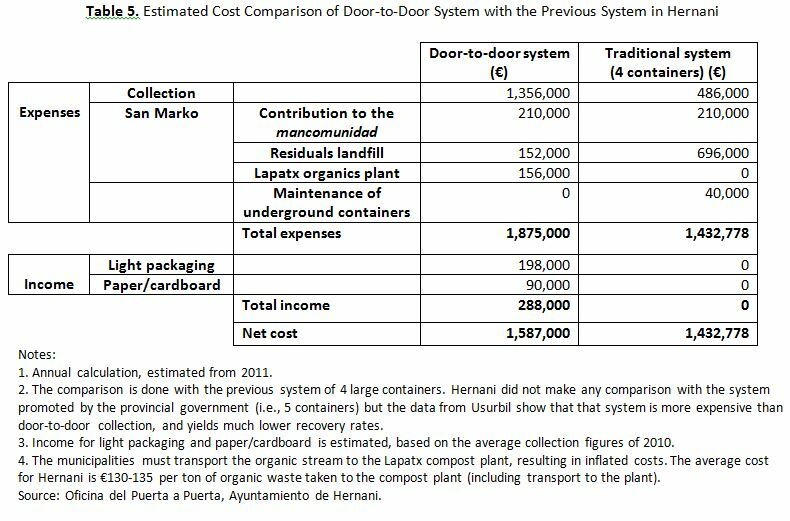 In the case of Hernani, the slightly higher costs for the door-to-door collection were due at least in part to the need to transport the organics to a distant plant.More importantly Hernani has to pay the same fee to the mancomunidad as before the system change despite having decreased the use of landfill. Once the system is changed so that the municipalities pay proportionally to the amount of waste they dispose of Hernani will have a clearly positive economic balance. It is also important to note that the door-to-door collection and recycling system has the additional benefit of creating more jobs than waste management strategies based on massive burying or burning; the extra money required to support the system provides a significant boost to the local economy. In total, 16 jobs were created in Hernani by door-to-door collection. 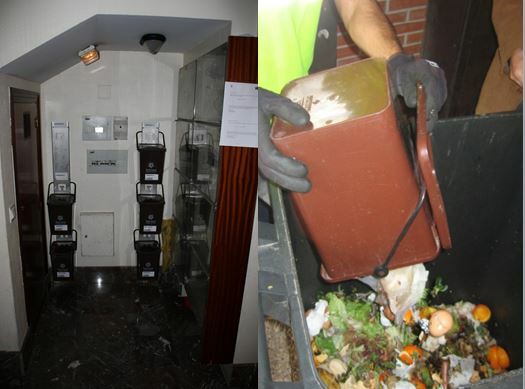 Today more and more municipalities in Gipuzkoa are implementing door-to-door collection of source separated waste, all with great results. Both governments and community groups are showing the positive changes produced by these strategies in terms of sustainable materials management, education, pollution prevention, and local economy. Moreover, what they are showing is that a community-based waste management system can bring impressive results in a short period, if only governments dare to lead the way and count on their citizens. Marian Beitialarrangoitia: “Tenemos una base sólida para poner en martxa el puerta a puerta.” 5 December 2009. Published in http://www.hernaniatezate.net/page/8/. Estimate based on waste production and collection data provided by Mancomunidad of San Marko. 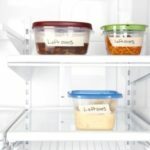 Thank you for this article, explaining how a zero waste system has been implemented. I especially liked the images that help to illustrate the solution: the bins with the owner’s names. This is a roadblock for many urban communities, where is easy to hide the non-participation or worse, hindering other people’s efforts. I think that this article is positive, in general. However, I would like to know what is done with the “waste” that is in fact re-usable, e.g. computers and other electronics, bicycles, furniture and other household items, etc. ; in what way is it recycled? Lorna, as you point out Zero Waste is not only about recycling but rather reducing waste. One of the ways to do this is by reusing items that otherwise would become waste such as bicycles, furniture, electronics… In Hernani one of the consequence of getting the incentives right have the opening of some reuse shops for these kind of items. When it comes to recycling products such as computers or tvs are sibjected to a extended producer responsibility scheme which takes care of recycling them.